Home > Surfing > What is Wake Boarding? Although a relatively new watersport the popularity of wakeboarding is growing fast and it has already surged past water skiing as the coolest way to ride the water by motorboat power. Wakeboarding is a watersport where a rider stands on a buoyant board and is pulled across the water by a motorboat. It is a fusion of water skiing, snow boarding and surfing techniques, borrowing the motorboat towing principal from water skiing, the wave tricks from surfing and the control and design of the board itself from snow boarding. The rider’s feet are kept firmly on the board with rubber binds, and because of these it is steered much in the same way as a snowboard. Wakeboarding is less concerned with speed than with tricks. These tricks are performed both on the water surface and in the air, and using the wake from the boat. The most spectacular tricks are collectively known as inverts, and are usually performed by launching oneself into the air in an inverse position. All that is required from potential wakeboarders is a reasonable level of fitness, fairly strong arms and a willingness to get wet and make a fool of oneself getting to grips with it. It can be somewhat intimidating to begin with, but after basic instruction it is relatively easy to get the hang of. The two main safety precautions are standard with all towed watersports. Firstly all wakeboarders must wear a personal floatation device (PFD) at all times in the water and secondly all boats must employ a ‘spotter’. This designated spotter must keep the driver informed as to the position of the wakeboarder at all times, whilst keeping eyes peeled for other water craft and hazards in the water. Everybody in the motorboat should stay alert and be aware of everything that is going on around them, whether it’s people in the water, anticipating what other boat drivers are doing or keeping track of the tow rope, making sure it does not get tangled up or that the boat does not run over it. Before heading out for the first time novice boarders should decide which foot they want to face forward. The chosen foot should be the one that is intuitively placed forward, such as when trying to regain balance. 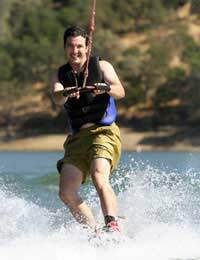 Novices should also adopt the beginner wakeboarding stance so as to make the board easier to control and navigate. This involves placing the front foot binding at about a 15-30 degree angle, slightly pointed towards the front of the wakeboard. The rear binding should be placed far back towards the end of the board, lined up at zero degrees, so that the boarder’s weight is able to press directly on top of the rear fin. Beginners are advised to use a shorter rope. This makes it easier for novices to get up and out of the water and also facilitates ‘clearing the wake’; since the wake is narrower the closer one is to the boat. A suggested length is between 30 and 50 feet. Until fully out of the water, boarders should stay in a crouched position with arms and knees tucked in. Upon being so, riders should then slowly and deliberately try to stand, trying to maintain an even balance and weight distribution. When getting up out of the water, a large part of the body weight should be concentrated onto the front foot. However, once a standing position is reached, the weight should be shifted back. Before establishing a preferred tow handle position, beginners are best keeping it low so that it is parallel to the water. This will make it easier to stay upright and out of the water. Beginner wakeboarders should cushion their falls by starting at slower speeds. A recommended starting point is 9 to 12 mph. Nevertheless wakeboarders do not want the motorboat to go beyond speeds of 19 mph however experienced they are - this is a tricks sport and not a speed sport.